Raw food diet for cats: recommended or ridiculous? Raw food for cats: the diet that’s catching on. More and more people are feeding their cats “raw food,” a term that bears a bit of mystery for some. In the cat world, raw food means raw meat, perhaps enhanced with a few greens and vitamins. (Nope, not a Ceasar salad or a green smoothie!) Many nutritionists are promoting the benefits of raw food for cats and some recommend it as the top choice over canned or kibble. Raw food can be fresh or frozen, homemade or store-bought. Several companies currently make raw food that is available frozen in “chubs” (sausage like tubes that are wrapped in plastic) or nuggets, or simply in plastic containers. This type of raw food is very similar to foods like hot dogs or sausages and may be the easiest form for handling by humans who do not eat meat themselves. Some people make their own raw food by purchasing a variety of meats and bones and cutting or grinding them into appropriate sizes and textures, which can also be made in volume and frozen. The idea of raw food is that it most closely mimics what a cat would eat in nature. Cats who are free-roaming catch mice and other small prey to eat (probably in addition to raiding some dumpsters). Such cats would eat several types of critters and some of those would have greens in their stomach. So, prepared raw food diets tend to include a bit of greens and some supplements to ensure the variety that nature would provide. When choosing a raw food diet for your cat, is important to read about the brand and to find out whether the food is all-inclusive or requires supplementation. For example, one company’s feline nuggets provide a complete diet and no supplementation is necessary, but the chub variety, intended to be only part of a diet, requires some additional nutrients to be served. People who feed raw rave about the results. Because the raw foods contain no filler, the feces of a cat on a raw food diet is dense and small and lacking in odor (who can argue with that?!). Another pus: it is very easy to control cats’ weight when feeding a fixed diet, especially raw. But be warned: If the cats have been free-feeding before the switch to raw, there may be some complaining about being served distinct meals instead. In real life, a variety of factors are at play in how cats eat and their success in adapting to a fixed diet and/or a raw diet. If a cat experienced early-life food deprivation, the cat just may not be able to adapt to a non free-feeding situation. 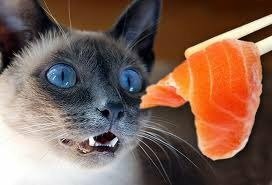 Or if the cat has food allergies, the raw food needs to be selected to avoid the allergy-causing food. Finally, raw food tends to be more expensive up front than some of the other options, though it may not be that much more if you are serving a premium cat food already. And costs may be offset over the long run by savings from the cat’s potentially better health. For many, it’s refreshing to see the pet food industry thinking outside the box and not just coming up with more flavors of junk food for cats. But remember, many cats do not take quickly to change; introduce new food slowly and with patience.